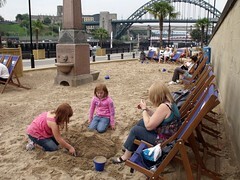 Took the twins to Newcastle on Tuesday and there was an artificial beach on the banks of the river Tyne. Seen this sort of thing in France before but not over here but apparently there was one last year as well. After a break for an ice cream, the girls went back to playing in the sand and I popped into the closest pub for a beer. The Broad Chare, they had two draught beers I hadn't had, both from the local Wylam brewery and they also had a large selection of bottled beers from around the world. 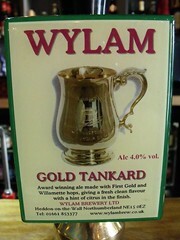 4.0% gold colour with a thin head, citrus hop aroma, citrus hop taste. 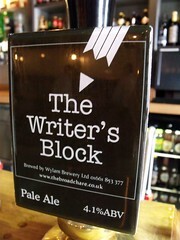 4.1% hazy gold colour with a thin head, strong fruity citrus hop aroma, very hoppy taste. Although I do not like my beers to be too hoppy, it was a hot sticky day and this was very refreshing.